Missouri’s second highest elected official blasted Democratic Gov. 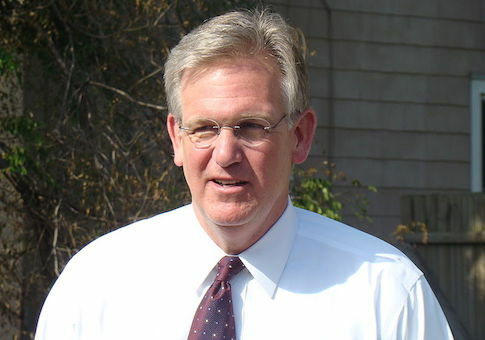 Jay Nixon for accepting lucrative union campaign donations after vetoing right to work legislation. Nixon received $50,000 from the United Auto Workers union just days after vetoing legislation that would have ended the practice of coercive unionism in the state. Republican Lt. Gov. Peter Kinder demanded a refund, criticizing the seeming quid pro quo. "Less than a week after he vetoed Right to Work legislation, Governor Jay Nixon received his reward: A $50,000 check from the United Auto Workers union, headquartered in Detroit. Gov. Nixon is constitutionally barred from seeking reelection. What use, then, does he have for this money?" Kinder said in a release on Tuesday. Kinder said the timing of the donation gave the appearance of corruption. "He should return the money. Otherwise, it smells of more ‘pay to play’ politics by this administration," Kinder said. "The governor likes to give lip service to putting limits on campaign spending while he rakes in millions of dollar from lawyers, lobbyists and labor." The Nixon administration did not respond to request for comment. UAW Local 249 served as the backdrop of Nixon’s veto announcement. Flanked by union officials and members, the governor said, "right-to-work is wrong for Missouri." "This extreme measure would take our state backward," he said. Local 249 has nearly 7,000 members, up significantly from the 4,000 members it had when he won his first election in 2008. It spent more than $100,000 on Nixon’s 2008 campaign, including a last-minute $50,000 donation. The pageantry of Nixon’s veto announcement sparked outrage from National Right to Work’s Mark Mix. "Today’s veto puts the governor squarely on the side of forced unionism, and against employee free choice. Flanked by union bosses, Gov. Nixon ignored and rejected the will of an overwhelming majority of Missouri citizens who favor Right to Work," Mix said in a statement. "The hardworking men and women of the Show Me State deserve better than Governor Nixon’s veto of the Missouri Right to Work Bill." Regardless of whether Nixon returns the money, Kinder said he hopes the legislature will override the veto when it reconvenes in the fall. "Lawmakers need to override his veto in September. Right to Work is a critical reform that will spur economic development in our state, and the Legislature has the opportunity to stop Gov. Nixon’s obstruction," Kinder said. The bill passed the Missouri Senate 21-13 on May 12 following a nearly nine-hour filibuster from Democrats. The House then passed the bill 92-66. Republicans would need 109 votes in the House and 23 in the Senate to override the veto. Update 3:51 P.M.: This article previously indicated that Kinder was not running for governor. He has not ruled out running.